The mouth of my Spectrum came with an instruction manual and a cassette named appropriately Chat Box. The mouth just plugs into the rear of the Spectrum. Once Chat Box is loaded, Sweet Talk invites you to its own Chat Show. It presents itself and gets started on a very interesting subject itself. It won’t stop talking about itself ... how wonderful it is ... and how everybody ought to admire it... That’s when I pulled out the plug and got the upper hand. Micro Command is better equipped than Sweet Talker. It comes in a bigger box and has a listening device which would do Terry Wogan proud. 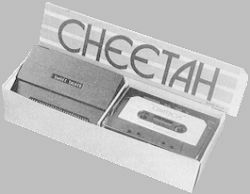 I played dominoes with the Spectrum add-ons, plugging the Micro Command unit into the Cheetah Sweet Talker into the Spectrum. I soon figured out where the mike plug was at home and loaded the demonstration tape. 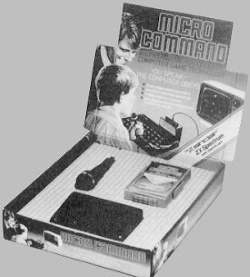 Micro Command and I got acquainted. We built up an intimate relationship. I suspected however that Micro Command had a bad ear, as I had to repeat every new word four times in a row before it acknowledged it. Once it got used to my spoken word it would understand me at the rate of seven to eight out of 10. I soon completed the silly game which was supposed to test our relationship and was able to progress to Sheep Talk. Here the originally keyboard-controlled sheepdog Rex, whose job is to round up the lot sheep in the sheep pen, has been replaced by a new Rex with a hearing aid. I soon suspected however that the battery of the hearing device had gone to the dogs — sorry — was on its last legs, for Rex would not obey me no matter how I shouted. I consulted the Micro Command Additional Information booklet. Two methods of listening are available: Micro Command listens to the entire word and then analyses it. With the second method Micro Command only listens to the beginning of the word and as soon as it has enough data will make up its mind before the end of the word. The first method may be slower, but error free communication is guaranteed for over 80% of cases. The second method is totally unpredictable with a success rate of 50% or less. It is my firm conviction that Rex is not only a slow mover but also a fast listener. However, I have heard from a good source (an ear at court, so to speak) that this is not so, and that the excitement of the game makes my voice unrecognisable to Micro Command. I apologise to Rex and surrender my position to more stoic shepherds. It didn’t take long for me to recognise the potential of combining mouth and ear with the Spectrum as grey matter lodged between the two. Many a games player may have wondered what this massively advertised Trickstick by East London Robotics is all about. The advertisement promises proportional control and patent applied pressure-sensitive sensors. Could this prove to be really the ultimate high-tech ultra-responsive proportional joystick for the Spectrum, a must for the arcade gamer? The Trickstick package contains the hideous control weapon, the Trickstick together with a narrow interface unit, displaying very shoddy workmanship, and two cassettes containing the software. The User Documentation explains in detail everything you wanted to know about the Trickstick. The device uses the capacitive effect of the human body to detect the commands of the player. This works in a similar way to the old touch-sensitive switches, but the Trickstick sensor works analogue and can detect varying degrees of pressure (surface and dielectric changes). The Trickstick is blessed with six of these sensors: two at the tip of the unit for left and right movement, two at the upper side for forward and backward movement, and two at the lower side for two independent fire actions. 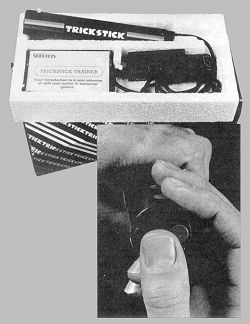 The documentation gives recommendations for gripping the Trickstick for both left and right handers. The left and right sensors are controlled by rolling the centrally located thumb, while the forward and backward sensors are handled (or fingered) with the fore and middle fingers. The remaining free hand is used to clinch the Trickstick at the lower end and to each for the Fire1 and Fire2 sensor trigger. Before all this can happen the interface, which is compatible with the Kempston interface requiring input port 30 monitoring, has to be plugged into the Spectrum edge connector port and programmed via plug in crosslinks. Up to eight Tricksticks can be connected, each requiring a different port address (7F9FH to FE9FH). Therefore one crosslink selects the port address and the second selects the work mode: proportional or stop and go mode. As the novelty lies in the analog behaviour of the animal, proportional control is selected and the Trickstick Trainer cassette loaded. Prior to play, however, the sensitivity control situated on the upper half of the Trickstick has to be adjusted to the individual sweaty hand. The setting is found by controlling the aircraft in the game and varying the sensitivity of the sensors until ideal response is reached. As promised, a certain proportional control can be achieved, but the left and right controls prove to be too far apart for simply rolling the centrally placed thumb over the sensors. The game certainly is fascinating and demanding especially with the unusual controls of the Trickstick, but the question is whether the analog control actually is an improvement over the humble microswitch actuated joystick. To this purpose a large selection of games ranging from Fighter Pilot (ideal for analog control) to Jetpac and Atic Atac (unsuitable) were played and tested with both the conventional joystick and the Trickstick. Various players confessed to noticing little or no improvement over the conventional joystick, most grumbling over the unfamiliar and unrelatable forward/backward movement of the fingers for the up/down movement on the screen. The document states that the software should be specifically designed to operate for the analog mode to achieve best results. It also gives an example as to how the program ought to read the joystick port, but this looks suspiciously similar to the usual digital joystick monitoring. Faster port scanning repetition rates may improve the analog feel if the unit works with statistical coincidences between a variable on/off ratio signal generated by the Trickstick and the pot read period. But this is only guesswork as no technical information is available.